1. Information for court use under subrule 14.03 (4.1). 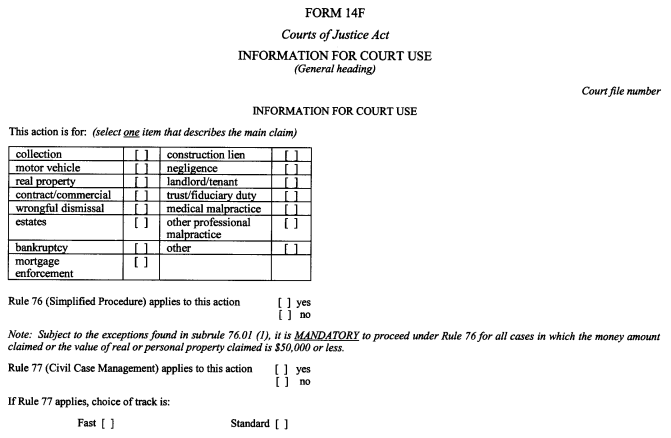 (4.1) Form 14F (Information for court use) shall be filed together with Form 14A, 14B, 14C or 14D, as the case may be. 3. (1) Clause 16.05 (1) (d) of the Regulation is amended by striking out “between 5 p.m. and midnight” and substituting “between 4 p.m. and midnight”. (2) Clause 16.05 (1) (f) of the Regulation is amended by striking out “between 5 p.m. and midnight” and substituting “between 4 p.m. and midnight”. (3) Subrule 16.05 (3.1) of the Regulation is amended by striking out “between 5 p.m. and 8 a.m.” and substituting “between 4 p.m. and 8 a.m.”. 4. Rule 20.03 of the Regulation is amended by striking out “concise statement, without argument, of the facts and law” and substituting “concise argument stating the facts and law”. 5. Rule 21.03 of the Regulation is amended by striking out “concise statement, without argument, of the facts and law” and substituting “concise argument stating the facts and law”. 6. Rule 22.02 of the Regulation is amended by striking out “concise statement, without argument, of the facts and law” and substituting “concise argument stating the facts and law”. 8. Subrule 37.10 (6) of the Regulation is amended by striking out “concise statement, without argument, of the facts and law” and substituting “concise argument stating the facts and law”. 9. (1) Clause 38.09 (1) (a) of the Regulation is amended by striking out “concise statement, without argument, of the facts and law” and substituting “concise argument stating the facts and law”. (2) Subrule 38.09 (3) of the Regulation is amended by striking out “concise statement, without argument, of the facts and law” and substituting “concise argument stating the facts and law”. 10. Rule 40.04 of the Regulation is amended by striking out “concise statement, without argument, of the facts and law” and substituting “concise argument stating the facts and law”. 11. Subrule 42.02 (2) of the Regulation is amended by striking out “concise statement, without argument, of the facts and law” and substituting “concise argument stating the facts and law”. 1. An examination in aid of execution. 2. The issuing, service, filing, enforcement and renewal of a writ of execution and notice of garnishment. 3. Any other procedure authorized by these rules for enforcing the order. (3) Clause 60.19 (2) (c) of the Regulation is amended by striking out “the minimum amount prescribed in Tariff A” and substituting “an amount determined in accordance with the costs grid established by Part I of Tariff A”. 13. (1) Clause 61.03 (2) (b) of the Regulation is amended by striking out “concise statement, without argument, of the facts and law” and substituting “concise argument stating the facts and law”. (2) Subrule 61.03 (3) of the Regulation is amended by striking out “concise statement, without argument, of the facts and law” and substituting “concise argument stating the facts and law”. (3) Subrule 61.03 (8) of the Regulation is amended by striking out “under clause 133 (b) of the Courts of Justice Act” and substituting “under clause 133 (b) of the Courts of Justice Act or under another statute that requires leave for an appeal”. 14. Subrule 61.03.1 (18) of the Regulation is amended by striking out “under clause 133 (b) of the Courts of Justice Act” and substituting “under clause 133 (b) of the Courts of Justice Act or under another statute that requires leave for an appeal”. (b) leave to appeal has been granted. (b) another statute that requires leave for an appeal. 16. (1) Clause 61.16 (4) (a) of the Regulation is amended by striking out “concise statement, without argument, of the facts and law” and substituting “concise argument stating the facts and law”. (2) Subclause 61.16 (4) (b) (ii) of the Regulation is amended by striking out “concise statement, without argument, of the facts and law” and substituting “concise argument stating the facts and law”. 17. (1) Subrule 62.01 (7) of the Regulation is amended by striking out “concise statement, without argument, of the facts and law” and substituting “concise argument stating the facts and law”. (2) Clause 62.01 (8) (a) of the Regulation is amended by striking out “concise statement, without argument, of the facts and law” and substituting “concise argument stating the facts and law”. 18. Subrule 62.02 (6) of the Regulation is amended by striking out “concise statement, without argument, of the facts and law” and substituting “concise argument stating the facts and law”. 19. Subrule 76.03 (1) of the Regulation is amended by striking out “after the close of pleadings” and substituting “after the close of pleadings and at the party’s own expense”. (ii) to have allowed the action to be continued under the ordinary procedure or under Rule 77, as the case may be, by not abandoning claims or parts of claims that do not comply with subrule 76.02 (1). 22. Subrule 77.06 (5) of the Regulation is amended by striking out “the notice of commencement of proceeding” and substituting “Form 14F (Information for court use)”. (c) in any other case, within 180 days after the proceeding is commenced. 1. Where a proceeding has been commenced in a county before the date set out in the Schedule to rule 77.01 for the county and where no defence has been filed as of that date, rule 77.08 applies to the proceeding and the 180-day period described in rule 77.08 begins to run on that date. 2. Where a proceeding has been commenced in a county before the date set out in the Schedule to rule 77.01 for the county and a defence has been filed before that date, the proceeding shall be dismissed by the registrar unless the parties have fixed a date for a settlement conference within 365 days from that date. (c) if the action is brought under the simplified procedure, the necessity of providing the list required under rule 76.03. 27. (1) Form 60F of the Regulation is amended by striking out “the minimum amount prescribed in Tariff A” and substituting “an amount determined in accordance with the costs grid established by Part I of Tariff A”. (2) Form 60G of the Regulation is amended by striking out “the minimum amount prescribed in Tariff A” and substituting “an amount determined in accordance with the costs grid established by Part I of Tariff A”. 28. This Regulation comes into force on December 31, 2002.